MRI and CT scans are the best way, at present, to see the joints to evaluate their health. Both scans are delivered as a series of images. Like flip-cards the series can be viewed as a movie. You can move from front to back, side to side and top to bottom examining minute details of the bone and soft tissues. 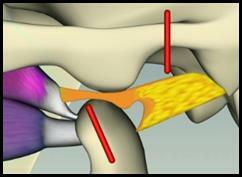 In the very center of the joint is a slippery, tough pad of cartilage squeezed between the end of jaw bone and skull. This disk is living tissue and when it fails the jaw is repositioned affecting the teeth, muscles and bone of the joint. As the mouth opens, the cartilage disk is pulled forward by muscle to keep it between the bones. 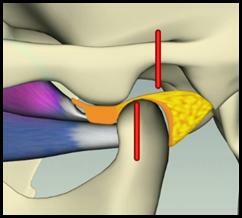 The motion of the joint pumps nutrients around the cartilage disk. It relies on jaw movement to stay healthy. Disk problems can be caused by poor occlusion of the teeth or can lead to poor occlusion of the teeth. Problems can be caused by injury or minor deformities in the bone or simply wear and tear as we age. Disk problems usually lead the way in joint degeneration. All joint problems are specifically classified and require specific types of treatment. The disk is what pops! As the jaw opens and closes the disk hangs-up at some point and, at another point, it releases suddenly and pops back. Sometimes it's painful and sometimes it's not. 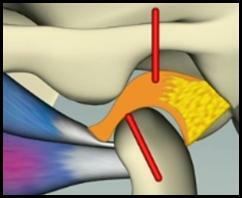 Over time the connective tissue that positions the disk is stretched and the disk slips further and further out of position. As the disk and ligaments stretch, the disk deforms and remains distorted. As it begins to fail it creates a variety of problems with or without pain. Opening wider than usual may cause a flare-up of pain, but the joint usually degenerates over time. No matter what initiates the problem the end result is that the disk is lost. During this degenerative process the complex muscles of the jaw joint begin to overwork to compensate for these changes. This leads to chronic pain. Over time muscles become a very real part of the mechanical problem in the joint. Treatment includes addressing the muscle problem and pain, but the underlying issues of joint deterioration and occlusion bite breakdown must be addressed. 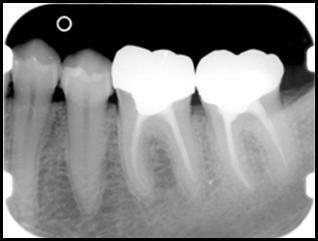 Crowns or caps, bridges, implants, and fillings are harder than our natural teeth so the natural teeth usually fail first. Over time as the mouth becomes lined with the harder materials the jaw joints suffer and other symptoms arise. Excessive wear from bruxism or grinding is a common symptom of TMJ dysfunction. 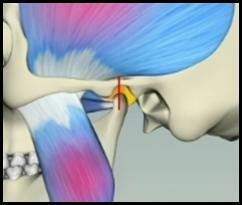 Muscle and joint pain are tremendously motivating along with limited opening, jaw locking and popping. Every patient is unique and a specific diagnosis is essential to create a complete picture and treatment plan.